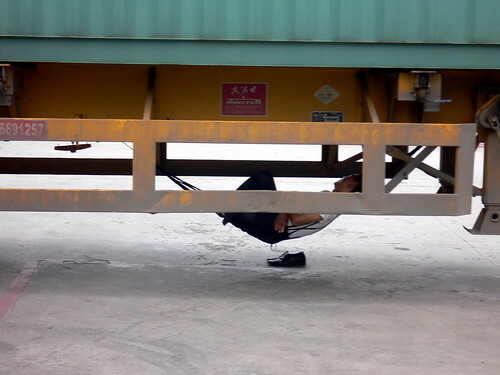 That's a freight container you are looking at and the driver sleeping in a hammock under it. It's the summer and with a little breeze, it can get very sleepy even in 30+ degrees heat. Loading a container usually takes quite a while and so while waiting for my guys to finish loading the container, the driver decides to catch 40 winks. A good plan if I may add. Otherwise, I risk having my goods strewn all over the highway as a result of the driver dozing off. Hmm... better to let him sleep. Here's the thing. So there I was, looking at a guy who drives a container truck for a living and earns a fraction of what I am earning. Yet, ironically, I am the one looking out the window, from my air-conditioned office, at him in envy. Spinnee: While I get what you are driving at, it may not be all bad to take his place. To everything there have their respective merits. Anna: Reminds me of my NS days where we koonz under the 3-tonner in the blazing heat.